A translocation is a type of abnormal change in the structure of a chromosome that occurs when a part of one chromosome breaks off and sticks to another chromosome. These "mutations" are an important cause of many types of lymphomas and leukemias. Our chromosomes store all of the genetic information we inherit from our parents. We have 23 sets of chromosomes—one set from our mothers and one set from our fathers—for a total of 46 chromosomes in all. On each chromosome are hundreds of individual genes that code for everything from the color of our eyes to the proteins that regulate the division of cells in our body. When our cells divide, a duplicate copy of our chromosomes is made. Sometimes this process goes wrong, and a portion of a piece of one chromosome may end up attached to another chromosome. When we talk about genetic changes in cancer, it can become very confusing, so we want to make sure one distinction is clear right away. Some genetic changes are inherited and are called germ line mutations, the kind of mutations or other genetic changes you have from birth, but most genetic changes you will hear about are acquired or somatic mutations—mutations and genetic changes that occur in your body after birth and later on in life. Balanced translocations - In a balanced translocation, equal parts of the two chromosomes are exchanged, so there is no extra or missing genetic information. Unbalanced translocations - In an unbalanced translocation, the exchange involves unequal portions of chromosome and leads to extra or missing genes. Translocations are indicated using a lower case "t" with the two involved chromosomes in brackets. For example, a translocation between chromosomes 9 and chromosome 22 would be indicated by t(9;22). Translocation is a type of genetic injury that may cause an otherwise normal gene to turn into a cancer-causing gene. 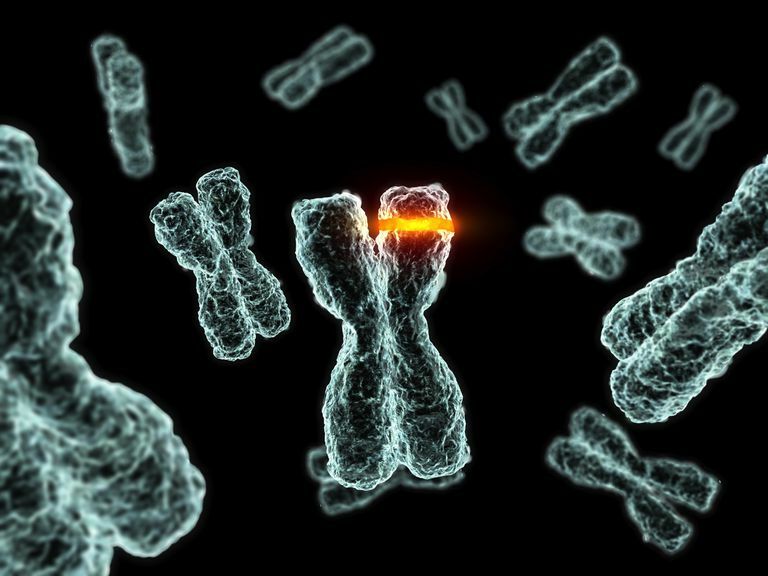 Scientists do not know precisely what causes these chromosomal changes to occur, but certain risk factors for the development of lymphomas and leukemias are known, and some environmental exposures may be involved in genetic damage. These changes may also occur when the DNA in our cells is damaged by a toxin or viral infection. However, they may occur as a result of a "mistake" in the normal process of cell division, too. Since our cells divide throughout our lifetimes, the chance that a "mistake" in division will take place increases the older we are. This is thought to be one of the reasons why many cancers are more common the older we get. To understand how translocations affect cancer risk it can help to understand a little about how genetic changes and mutations result in cancer. It's thought that translocations may work by turning oncogenes (cancer-causing genes) on, or by turning tumor suppressor genes to the off position. Tumor suppressor genes are genes that help govern cellular steps that, when out of control, could lead to cancer; they essentially act like the brake system in a car, whereas oncogenes act more like an accelerator that is stuck in the on position. For the most part, the translocations resulting in leukemias and lymphomas are due to acquired changes in DNA, but this is not always the case. It is usually a combination of genetic changes rather than one or two that results in a cancer, and in some cases, some of these changes may occur before birth. For example, in some children with acute lymphocytic leukemia, the initial genetic changes may occur while a baby is still in the womb. Chromosomal translocations play a large role in blood cancers. It's estimated that translocations are present in up to 90 percent of lymphomas and over 50 percent of leukemias. Physicians discover chromosome translocations when doing a genetic analysis of biopsy samples. Such findings often help not only to identify the disease, but also to plan therapy and predict treatment outcomes. Some translocations, for instance, may be indicative of disease that is more or less responsive to chemotherapy. However, each person is different, and even two people with the same translocation can have very different outcomes. Nambiar, M., and S. Raghavan. How does DNA break during chromosomal translocations? Nucleic Acid Research. 2011. 39(14):5813-5825.